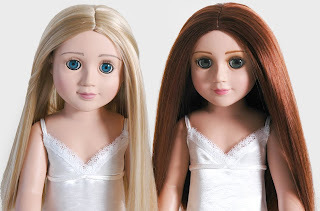 Welcome new Carpatina dolls - Erin and Zoe. And so did the ZoEn label - clothing line began. You take what you can find, thought Zoe with a sigh. But right now there was very little to find in the community theater's wardrobe. How was she supposed to design something “stylish, dazzling, and magical” with the bits and scraps from shows 30 years ago? Yet Mr. Davies, the director, was used to spinning magic from invisible threads. And Zoe didn't want to be the one to let him down. 'Have you tried the back room?” the woman suggested. It was as though Ali Baba's cave had appeared before them. For there in the dim light of the room shimmered, glistened, rustled, and whispered a treasure of garments from every era in the last 100-no 150-years. “And there's something in the pockets for you girls,” said the woman. “But…” a thousand questions poured through Zoe's brain. From the outside corridor, Mr. Davies' voice came to them. “Zoe! What have you dreamed up for my leading lady?” he shouted.